Rochester, NY, USA – Leading researchers and clinicians from across the globe gathered in Rochester on October 18–19 to recognize the career of Edward Messing, MD, FACS, and his 35 years of accomplishments in improving care for individuals with bladder, kidney, prostate, and testicular cancer. The Festschrift honoring Messing, a professor in the University of Rochester Medical Center (URMC) Department of Urology and the Wilmot Cancer Institute, was the subject of a special edition of the journal Bladder Cancer. Los Angeles, USA – Renowned cancer clinician and scientist Dan Theodorescu, MD, PhD, has been named director of the Samuel Oschin Comprehensive Cancer Institute at Cedars-Sinai. 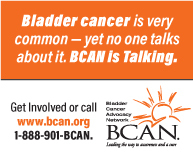 Amsterdam, NL and Bethesda, US – IOS Press, an international scientific, technical and medical publisher, and the Bladder Cancer Advocacy Network (BCAN), are pleased to announce that the journal Bladder Cancer is now the official journal of BCAN. Bladder Cancer (BLC) is proud to announce the launch of the Bladder Cancer Funding Analyzer (BCFA) on the BLC website. It is a free service that is part of a new suite of online features that have been designed to serve the needs of the bladder cancer research community. We are delighted to announce the publication of the second issue of Bladder Cancer (BLC), the first journal dedicated to the disease. The second issue is freely available here. The ability to map the human genome has transformed how scientists and researchers classify various cancers. In the past, cancer cells were examined through a microscope and their appearance, often enhanced with dyes or other agents, was used to categorize the type of cancer. We are pleased to inform you that Bladder Cancer now has its own Twitter account and Facebook page. Matthew Nielsen and Angela B. Smith have agreed to act as Social Media Editors. Over the past ten years, the field of researchers dedicated to bladder cancer has flourished. Until recently, there has not been a journal solely focused on advances relevant to bladder cancer, across the continuum of research.